At Restoration Urban Ministries, residents are housed. We strive to keep families intact by providing secure and comfortable housing in a hotel-style setting. Each family is assigned their own, lockable unit consisting of a main living area and full bathroom. Rooms come furnished and equipped with linens, a television, a full size refrigerator, microwave, and a crock pot. Residents are expected to keep their units clean and presentable. Units are inspected by staff regularly. On-site laundry facilities are provided for $1 per load. All residents have access to Restoration’s large, on-site shared-use kitchen, which consists of four stoves and ovens, cookware, and six dining room tables and chairs. Restoration also provides residents with an on on-site, supervised nursery facility. 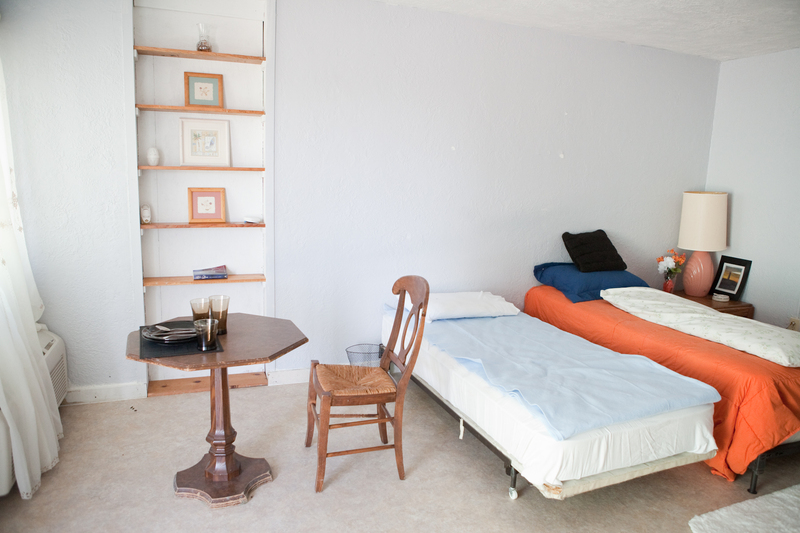 The 520 square foot space comfortably houses the toys and equipment needed for birth through age five. A teen center is available to teenaged residents during supervised hours. The space includes a refreshment area, arcade games, comfortable seating, and a wall-mounted television. A playground structure is available to provide exercise and entertainment to Restoration’s youngest residents. The mulched site is conveniently located next to the Resident Inn and includes climbing equipment, a slide, swings, and a sheltered picnic area. A basketball hoop is nearby. It costs $750 per month to house a family and cover their participation in our Transitional Housing Program. Our program participants are required to pay a $50 per month program fee and work 15 hours per week in assigned duties to help offset that cost. We average 105 resident participants and children each month in our 74 room Inn. Average length of stay at our facility is 11 months. The playground outside the facility was donated and built by the Lutheran Church of Mahomet to help the children at Restoration enjoy their stay with us. A small laundry facility is provided for families to clean their clothes. A small teen recreation center is open when staffing is available.